As Microsoft prepares to unleash Windows 8 upon the world tomorrow, a number of launch events are scheduled around the world, but the largest of them all takes place in New York this afternoon. We’re expecting to hear news of Surface and Windows, while numerous new high-profile applications for the Windows Store are likely to be unveiled. For all the news as it happens, join us right here for all the news as it happens. 15:40 While we wait for things to kick off, why not watch our Windows 8 overview? 16:09 Plenty of time to get some beef Hula Hoops. 16:16 We should be live now. If you want to watch along with us then the kind folks at Microsoft have provided a stream. 16:19 Starting with a video: The World Is Ready. 16:21 Steven Sinofsky is up, talking about building on the success of Windows 7. 16:22 They’ve sold over 670,000,000 licenses. 16:23 2PB of data added to SkyDrive every month. 16:24 Now talking about the advances in technology since Windows 95 came out. 16:25 Windows 8 is reimagined for the next billion users. 16:26 Windows 8 will be available at 12:01am tomorrow in every time zone. 16:27 8 was built on the foundations of 7. 16:28 Cold boots on new PCs in 10 seconds. 16:29 1,240,000 hours of testing in 190 countries. 16:30 Designed for touch and to be alive with the activity that matters most. 16:31 1,000 devices have already been certified for Windows 8. 16:32 There will be new Ultrabooks today, with some sporting touch screens. 16:33 Moving on to the Windows Store, officially opening today. 16:34 Hundreds of new apps every day, with the rate increasing each day. 16:35 231 markets for the store. Largest app selection at opening of any app store. 16:36 Now we have Windows Retweet RT, featuring Office 2013. 16:37 Windows RT currently supports over 420,000,000 peripherals, including mice, keyboards and printers. 16:38 Now there’s an advert featuring Best Coast and guitars. 16:39 Mike Angiulo and Julie Larson-Green on stage to demonstrate. 16:41 They’re just taking a look at the core. I think we did that better, but they’re not doing too badly. 16:44 The desktop is now even better. Run it side by side with Store apps. 16:45 Now talking about SkyDrive and Windows Phone. 16:47 They’re showing off the HTC 8X, a Lenovo ThinkPad Tablet 2 (with stylus!) and an Acer Aspire S7 Ultrabook. 16:49 Touch notebooks start at just $499/£400. 16:52 Showing off Hulu with snapped email. Into the Wikipedia app (via Store) with the video still playing. Search is universal. 16:53 Julie’s using Urbanspoon now. Sharing is easy, and now exploring NY with Bing Travel. 16:55 Jetpack Joyride is available on Windows 8. Goodbye productivity. 16:56 Now they have the Lenovo IdeaPad Yoga, Dell XPS tablet and Samsung Ativ Tab. 16:57 Swapping now to the Asus Vivo Tab RT and Microsoft’s own Surface which gets a rapturous applause. 17:00 He’s looking intense and talking about the benefits of a Microsoft account. 17:01 Biggest Windows ever with ARM and tablets included. 17:05 New Office “works great with a stylus”. 17:06 Great support from media outlets for apps. IE10 sites can be pinned. 17:07 MSN is the first site to be designed for Windows 8 and IE10. 17:08 SkyDrive is great for documents, while Outlook and the new Skype app are great for communication. 17:09 Rich entertainment experience with the Xbox brand, including free streaming music. 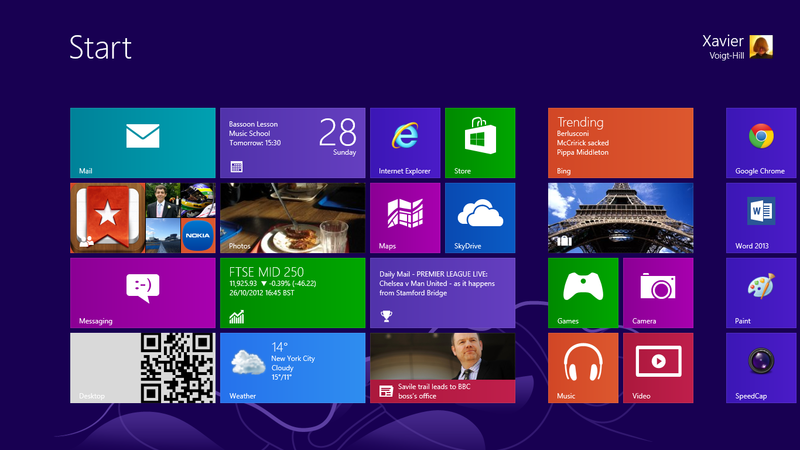 17:11 Similarities to Windows Phone are positive – with live tiles, Microsoft Accounts and SkyDrive. More on that on Monday. 17:11 He said developers. Be warned. 17:15 And that’s a wrap. 17:15 A whole load of uniformed people went on stage, music started playing and the lights dimmed. I can’t be the only one that was scared of a dance there. 17:15 And that’s all folks! We’ll be back on Monday for the Windows Phone and Android events! 17:16 Thanks for joining us!